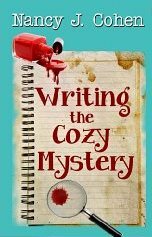 A few days ago one of my favorite cozy writers, Nancy J. Cohen posted on Facebook that her new book Writing the Cozy Mystery was available in Kindle for all of 99 cents. I bought it immediately, and I just verified that is still on sale for 99 cents. 1. Could I write a Cozy? 2. Is it hard work? 3. Is there some kind of formula? The answers are yes, yes and yes. The book does not disappoint. I feel as if I’ve been gifted with a precise step by step road map to writing a good first draft. I’m actually cutting and pasting some sections into a word document to give me direction in outlining my first ever foray into Cozy writing. NOTE: To cut and paste, you’ll need Kindle for PC (it’s free). Some information in the book will be just a refresher for most writers, but I found the lists and hints helpful to have in front of me, so I could answer the questions for each character. It’s important to know your characters as intimately as you know good friends: their likes and dislikes, environment, job, dreams, fears, friends, past. Most of this won’t go into the book, but informs the actions, reactions, and interactions of your characters making them come alive for the reader. Cohen uses a 3 ring notebook and a storyboard. “For a quick visual reference, I use a Storyboard or plotting chart. Divide a large white poster board into twenty blocks, or however many chapters will appear in your novel. Then write down all the story incidents or plot points that come to mind on sticky notes. Put these around the board in some sort of order. This gives you a general guideline for writing the synopsis. There is a software that is similar to her block system, but I’d rather work with a notebook, poster board and post-its as she suggests. That way it’s in front of me while I write. I’ll be blogging about the experience from time to time beginning with my this post. James thought. Thanks Dad, I’ll make you proud. I’m doing it Dad. I’ll be the youngest detective ever on the force.